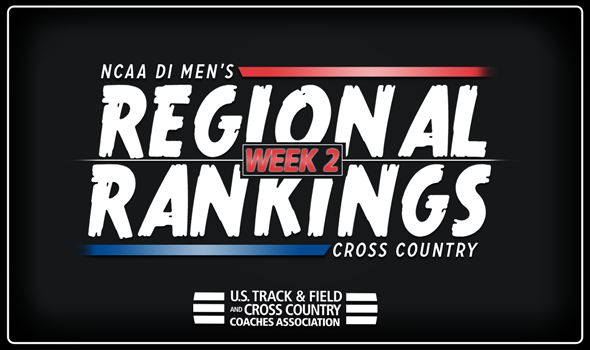 NEW ORLEANS – There might be a lot of racing going in NCAA Division I Men’s Cross Country across the nation, but there haven’t been a lot of changes to the Regional Rankings released weekly by the U.S. Track & Field and Cross Country Coaches Association (USTFCCCA). Teams that were in the top-2 of each of their nine respective regions following the Week 1 batch of rankings stayed in place following another busy week on the grass circuit. The USTFCCCA Regional Cross Country Rankings are determined subjectively by a single member coach in each respective region. The regional representative is tasked with weighing returning teams’ strength with current season results (if applicable) in determining predicted team finishes at the NCAA Regional Championships, which will happen across the nation on November 9, eight days ahead of the NCAA Championships in Madison, Wisconsin. No changes to the top-5 here as Wisconsin, Michigan State, Indiana, Michigan and Notre Dame all sit in order No. 1 through No. 5. The Badgers finally opened their season this past weekend at the Badger Classic – one of four meets they’ll host at the Thomas Zimmer Championship Cross Country Course – and looked strong in a winning effort. Olin Haker won the individual title with a time of 25:17.1, 17 seconds ahead of teammate Tyson Miehe. The Spartans and Wolverines went 1-2 at the Spartan Invitational this past weekend with abbreviated teams, while the Hoosier won the Iona Paddy Doyle Meet of Champions and the Irish took the team title at the National Catholic Championships. No changes to the top-5 here as Princeton, Villanova, Georgetown, Penn State and Penn remain No. 1 through No. 5 in order. The Tigers, Hoyas and Nittany Lions didn’t race, but the Wildcats squared off against the Quakers at the Main Line Invitational. Villanova squeezed in front of Penn 33-37 and took full advantage of Casey Comber’s individual win. Iowa State and Oklahoma State are still No. 1 and No. 2, respectively – but there were a few changes behind them in the top-5: Minnesota went from No. 4 to No. 3, Bradley went from No. 5 to No. 4 and Tulsa went from No. 6 to No. 5. Each of those teams that moved up in the top-5 posted a win this past weekend. The Golden Gophers romped at the Woody Greeno Invitational. The Braves captured the team title at their own invitational. The Golden Hurricane cruised to a title at the Missouri Southern Stampede. No changes to the top-5 here as Northern Arizona, BYU, Colorado, Colorado State and Southern Utah remain No. 1 through No. 5, respectively. The biggest difference between Week 1 and Week 2 is that we finally got to see what BYU could look like in 2018. The Cougars opened their season at the BYU Autumn Classic and steamrolled the field. BYU sent its top-5 runners across the finish line between 20:56.2 and 20:56.8. The Thunderbirds fared well this past weekend, too, using a 25-second spread to nab the team title at the UC-Riverside Invitational. No changes to the top-3 here as Syracuse, Iona and Stony Brook sit No. 1, No. 2 and No. 3, respectively. The Gales were the only unit out of the three to race this past weekend as they sent a horde of freshmen into battle at the Iona Paddy Doyle Meet of Champions and finished fourth. Columbia moved up two spots from No. 6 to No. 4 after finishing runner-up to Indiana at the Iona Paddy Doyle Meet of Champions. The Lions were led by Brian Zabilski, who finished fifth overall. Providence dropped one spot from No. 4 to No. 5. No changes to the top-5 here as Alabama, Middle Tennessee, Ole Miss, Florida State and Tennessee all sit in their respective spots from Week 1. We should get a clearer picture of how this region stacks up in the near future as the Crimson Tide and Blue Raiders will race their ‘A’ teams next week at the Nuttycombe Invitational and the Greater Louisville Classic, respectively. No changes to the top-3 here as Arkansas, Texas and Texas A&M remain in order. The Razorbacks only raced five men this past weekend at the Badger Classic and finished runner-up to the host Badgers. Rice popped from No. 5 to No. 4 and McNeese State climbed from No. 6 to No. 5. Hurricane Florence caused the cancelation of a lot of meets in this region this past weekend and because of that, the top-4 didn’t change. Campbell, Virginia, NC State and Furman all couldn’t race this past weekend but maintained their spots from Week 1. Liberty jumped two spots from No. 7 to No. 5 following its effort at the Iona Paddy Doyle Meet of Champions this past weekend. The Flames finished third as a team as Azaria Kirwa earned the individual title in a time of 25:01.0 at Van Cortlandt Park. There were no changes to the top-5 this week as Portland, Stanford, Oregon, Washington State and UCLA remain in their same spots. The Pilots and Ducks are scheduled to tangle at the Bill Dellinger Invitational this weekend, while the Cardinal has the week off in preparation for the Stanford Invitational next week.